St. Petersburg, April 4, 2016. 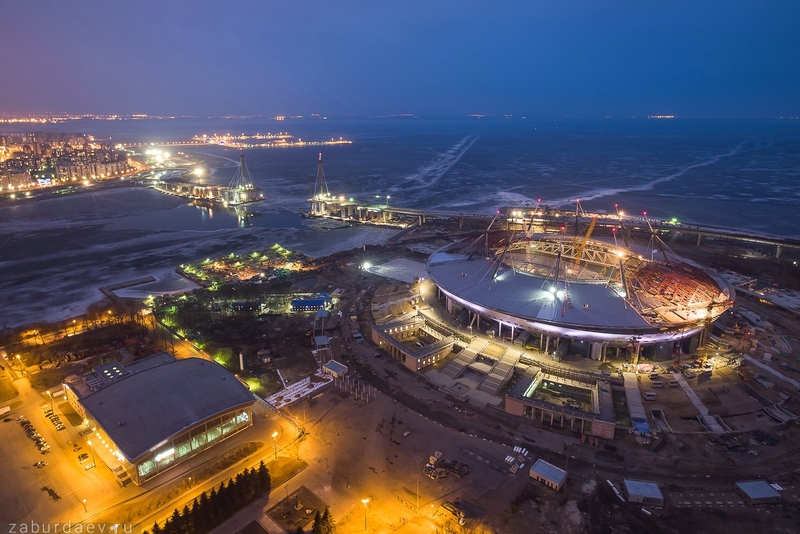 - The company "Inzhtransstroy-SPB", the general contractor of the stadium construction on Krestovsky Island in St. Petersburg, tells about the main works, which were held at the stadium in March. On Thursday, March 31, the final 161-ton block of the retractable roof of the stadium on Krestovsky Island has been raised. All twelve blocks of the retractable roof, with a total weight of two thousand tons, took their place. The main works on the roof are being carried out by the employees of the "Inzhtransstroy-SPB" bridge unit. They brilliantly performed the assigned task and once again reaffirmed their highest qualification. - Installation of the last block of the retractable roof has completed an extremely difficult and important stage of the construction of the stadium, which was launched in January 2014. This work was started by the company "Mostotryad-19", which was not able to finish it, and ceased to exist. The General contractor had to put extraordinary effort to complete the work on their own, without interrupting the construction process. A lot of non-standard and complex design, engineering and management decisions were made in process of building. The construction of the roof involves highly skilled workers and engineers, mostly from St. Petersburg. Implementation of the roof design is the tremendous achievement of the builders from our city. It will be the legacy of the national engineering and construction ideas for many generations of our citizens. Within the next few days the jib of the 600-ton crane will be shortened, and then it will be disassembled completely. In the second half of April, the second 750-ton crane will be disassembled. Almost two thousand airfield reinforced concrete slabs, on which the cranes drive, will be completely dismantled in the first half of May. At the moment, there are three layers of these slabs on the field. After that, active work on the concreting of the field base and installation of the tracks on which the field will roll out will begin. The raised blocks will be further united with each other (the final assembly of the joints on the southern half of the roof will occur by April 12, the northern half will be ready before April 18). The painting of the roof and pillars is in process (will be complete in June). Next the roof needs to be covered with the translucent film. The so-called roofing "pie" or covering of the fixed roof is being installed: a special vapor barrier film is being placed on the roof, the subsystem is being mounted on next, and then goes the thermal insulation with an aluminum seam roofing on the top. The sliding part of the roof is being moved on the rails, on special trolleys. Each half of the roof is equipped with fourteen driven trolleys. Today the roof units are installed on twenty permanent and eight temporary trolleys. Now the remaining permanent trolleys are being manufactured and installed on the driving tracks. The automation systems that will manage the process of opening and closing of the roof are being prepared. After all main roof loads will be formed, the cables will be adjusted according to the project stress. The works on the retractable roof, including the test of all systems, will be fully completed in August. Stylobate facade is being insulated and prepared for finishing. The stadium territory is being equipped, fans access zone pavilions along the small ring roads are being established. The constructors have started to cover the stair cascades on the hill with granite. All works on the stadium on Krestovsky Island will be completed according to the current state contract in December 2016. Common preparedness of the stadium and its individual systems are usually evaluated in two ways. The first method is to evaluate the physical completion of works on the stadium. The second way is to evaluate the work that is fully documented and accepted by the customer. Percentage of readiness according to the first, physical evaluation, will always be slightly higher than the percentage of readiness according to the second, the documented one: acceptance process takes some time. In order to synchronize the reporting to the citizens of General Contractor and Customer construction, General Contractor will report the percentage of accepted and documented work in official press releases and on the page of readiness of the stadium: http://piterarena.com/en/completion . In the news on our web resource, we will be adding information of the General Contractor on the percentage of physical work performed.